An external link from a dashboard to a website or another browser-based system can be handy for allowing users an easy way to more information. You can insert a link in a text field on the dashboard - but it needs to be a full path (and links can get pretty long and ugly). 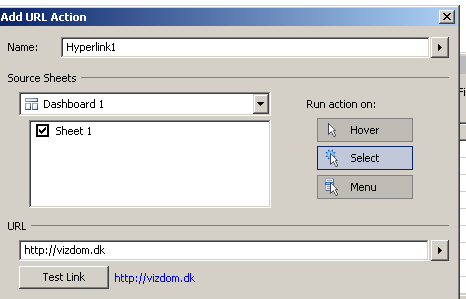 This workaround will do the trick and give you the ability to control the title of the link. The concept is to create a new datasource and let the data be a link by creating a dashboard action. Create a sheet like this in excel. The text in row number 2 will be the link title. 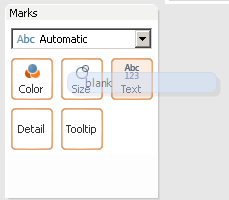 Copy/paste the data in Tableau or save the file and open it. 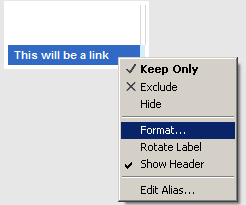 Move "Link" (or the name you gave the first row) into the Rows field. 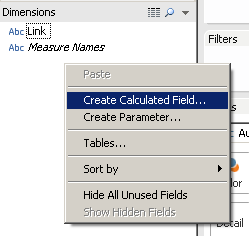 Create a calculated field by right clicking in the Dimensions field. Fill it out with "black" as name and two quotes with a space in the middle as formula. 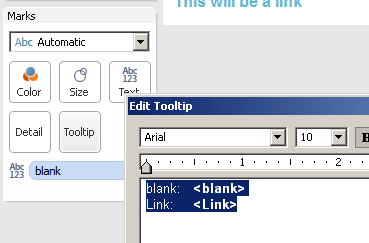 Lastly drop the new calculated field on "Text" in the Marks shelve . And notice the "Abc" text is gone. 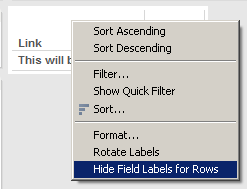 Right click on "Link" in the sheet and "Hide field Labels for Rows". Remove the borders under Format -> Borders in the menu. 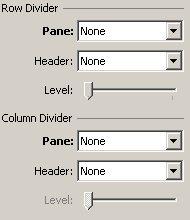 Select "None" under the headers "Row Divider" and "Column Divider"
Right click on the title and "Format"
Open a dashboard, move the sheet onto it and right click and "Hide Title". 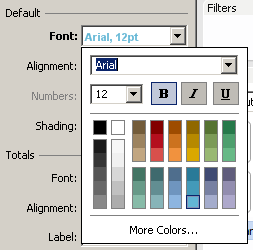 Remove the tooltip by selecting "Tooltip" on the Marks shelve and removing all the text. 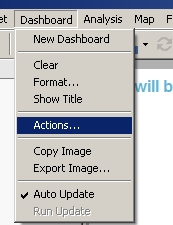 Select "Add Action" and "URL"
Fill in the URL field and pick "Select" "Run action on".